TACLOBAN, Philippines (AP) — Filipinos are facing the powerful Typhoon Mangkhut with the memory of another devastating storm still fresh in their minds. Nearly five years ago, Typhoon Haiyan left more than 7,300 people dead or missing, flattened entire villages, swept ships inland and displaced more than 5 million in the central Philippines — well to the south of Mangkhut’s path. 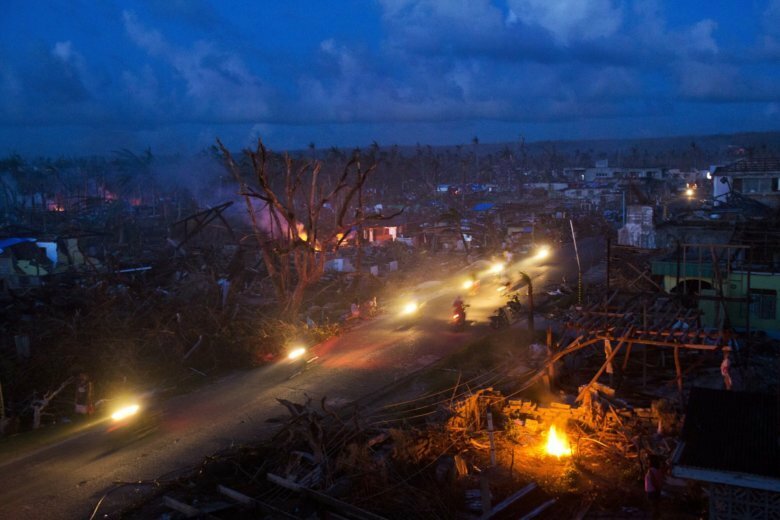 Haiyan demolished about a million houses and displaced more than 4 million people in one of the country’s poorest regions. Residents steeled themselves for the high winds, floods and mudslides that routinely come with the typhoons that afflict this tropical nation. But virtually no one was prepared for Typhoon Haiyan’s storm surge, a 6-meter-high (20-foot-high) wall of water headed straight for them. By now, the family was on the dining table, watching in horror. Alexa’s brother, Victor Vincent, glanced at the ceiling as the precious pocket of air grew smaller. They thought of escaping, but Linda couldn’t swim. The worries, in Talcoban and around the world, had been on the wind much more than the water. That’s why many of the 800,000 people who were evacuated found themselves in seemingly sturdy concrete buildings that could not protect them when the storm surge sea water pushed by the typhoon rushed in. In another part of Tacloban, Eflide Bacsal was standing in the kitchen of her family’s home when the wall of water hit with a furious roar. She couldn’t breathe. Couldn’t think. Couldn’t see. In her panic, she began swallowing water. Everything went black. She felt herself dying. She surrendered. And then, a hand appeared her father’s. He grabbed her shirt and yanked her to the surface. He hauled Eflide to the second floor of their home, where they waited along with Eflide’s sisters and mother until the surge had passed. Other family members were less fortunate. Relatives including Eflide and Gennette’s brother, 38-year-old Gonathan Bacsal, had taken refuge in a church, but they fled as water rushed in. As they ran through nearby woods, a cousin was decapitated by a piece of metal that whizzed through the air. As Alexa and her family stood on their dining table, they contemplated their own deaths. The water was at Alexa’s chest, and her mother’s chin. “Where will we go? What can we hang on to?” Alexa cried. Fish flittered across Alexa’s back, and she recoiled in a panic. There have been no major food distributions. The city’s main hospital has been gutted. Medicines are running out. Police can be seen chasing scavengers through the streets. Amid the ruins, desperate residents frantically waved their arms. Many had scrawled desperate messages in the ruins: “HELP! FOOD. WATER.” Some messages appeared to be in chalk. One cry for help was spelled out in white clothing.